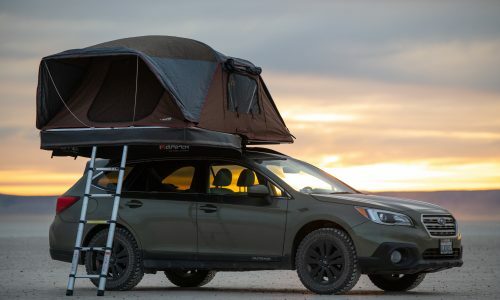 One of the hottest trends in car camping over the past few years has been the sudden rise in popularity of the roof top tent. These shelters have been a fixture amongst overlanders for years, but have only just begun to crossover into the outdoor world as well. 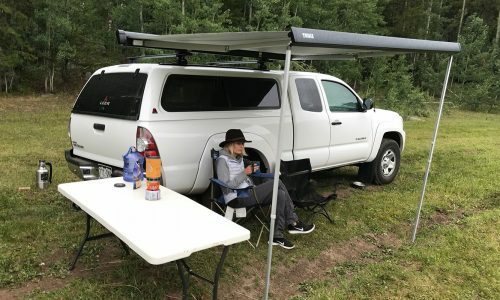 Now, an entirely different type of camper is discovering the roof top tent for the very first time, and they’re finding them to be a comfortable, spacious, and convenient alternative to more traditional camping shelters. 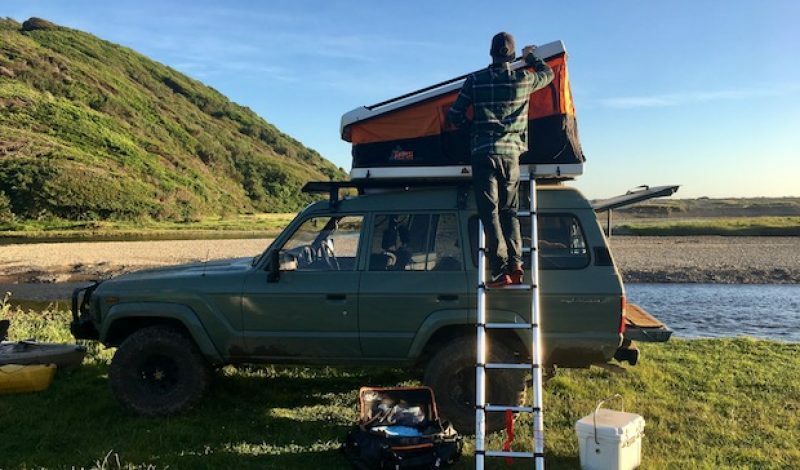 Recently, we had a chance to try one out for the very first time when Tepui – one of the premiere brands in the roof top tent market – invited us to join them on a camping trip along California’s Lost Coast. The trip offered everything we love about a good camp outing, including breathtaking scenery, amazing wildlife, and a chance to put some new gear to the test. 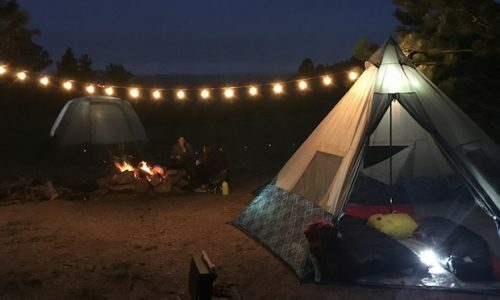 We ended up spending our days hiking, paddling, and exploring the stunning landscape, while at night we huddled around the campfire, shared stories, and enjoyed some wonderful food. And when it came time to call it a day, we crawled into some of Tepui’s most popular offerings to get some rest. Our trip to the Lost Coast began by first flying into San Francisco and then driving five hours north to get to our secluded and scenic campsite located right on the beach. As we drove in along a bumpy, muddy road, we could see the Pacific Ocean off in the distance, while a group of five young bull elks grazed in the tall grass not far from shore. It didn’t take long to realize that this was a special place, and that Tepui – working in conjunction with Four Points Adventures – had picked an amazing place for us to camp for a few days. Establishing our campsite didn’t take long, particularly since we didn’t have to spend much time setting up tents. After we parked the vehicles, we spent just a few minutes getting each of the Tepui shelters erected. The company’s new White Lightning hard shell model simply popped up and was ready to go in less than 30 seconds, while the larger Sky series shelters took a couple of minutes to go from completely collapsed to fully built, including the installation of a rainfly. In each instance, the set-up was far faster than it would have been to build a ground tent, and we were all ready to move into our new temporary homes in less than five minutes. 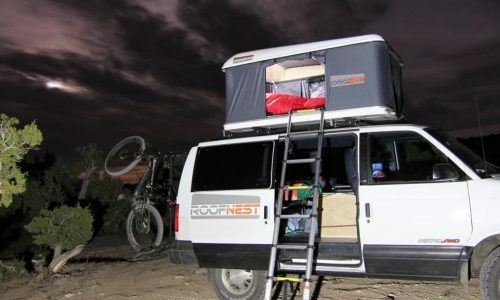 Each of the roof top tents is accessed using an included 8′ ladder that connects securely to the shelter itself. If there is one thing that campers will have to get use to when making the transition to a roof top model, it is climbing up and down that ladder when they want to get in and out. 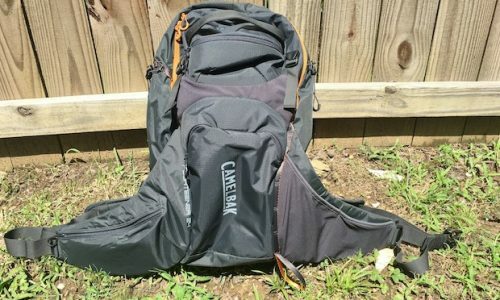 This isn’t a major issue by any means, but it does require a shift in thought, as your backpack is no longer located just outside the door and if you forget to bring something up into the tent with you, you’ll have to crawl back down again to go in search of whatever it is you need. Fortunately, other than the White Lightning which can be a bit cramped for space, each of the Tepui tents has plenty of room inside, which makes it possible to simply bring your pack up the ladder with you and have all of your gear close at hand. In my case, I stayed in a Kukenam SKY in Siberian Camo, and was lucky enough to have the place all to myself. Typically that tent would be big enough for up to three people, so going solo was a bit like enjoying the penthouse suite. It also afforded me the luxury of spreading out all of my gear with room to spare. Each of Tepui’s tents comes with a foam mattress, which is light years more comfortable than sleeping on an inflatable pad resting directly on the ground. I wouldn’t go so far as to say the mattress is as nice as crawling into my own bed back home, but it certainly felt luxurious compared to some of the other camping trips that I’ve been on. When you also consider the fact that the tent is suspended in the air, well above the damp earth, you begin to fully understand why overlanders have been enjoying this method of camping for quite some time. And should it start to rain in the middle of the night, the included rainfly keeps moisture at bay and you won’t have to worry about whether or not a newly formed river is running directly beneath the spot you chose to make camp for the night. Sleeping in the Tepui tent was incredibly nice. I not only had plenty of room to stretch out, but it was also warm and comfortable too. In fact, on one of the nights it was actually a bit too warm, which was quickly rectified by opening a few of the side windows to get a bit of air flowing through. The built-in mattress extends edge to edge, so unlike when you’re sleeping on a pad, you don’t have to worry about rolling off of it. And since it is made of foam, it doesn’t make a lot of noise throughout the night either. 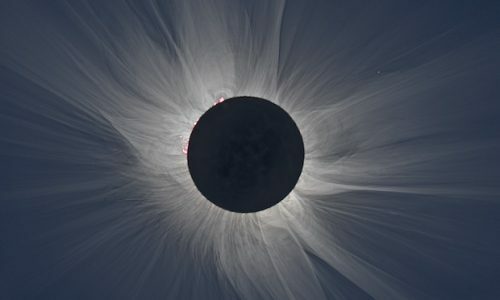 This led to a much more restful sleep and my fellow campers and I woke up far more refreshed and ready to go the following morning. Of course, roof top tents do come with a couple of drawbacks, with the most glaring being that they, you know, require a vehicle. That means that you can only take one with you if you are staying in campsites that are accessible by car. If you’re backpacking into the backcountry, you’ll still need to revert to an old fashioned model. The tents also have an installation process that according to Tepui is fairly quick, easy, and intuitive. In our case, the tents were already installed on the vehicles that we used on our outing, so I can’t really comment much on that process. But once the tent is in place, chances are you won’t want to take it off and on all that often. Fortunately, most models have a relatively low profile (especially the White Lightning) and can stay firmly attached to your vehicle, even when you’re not planning on going camping any time soon. The other drawback to the roof top tent is the price. 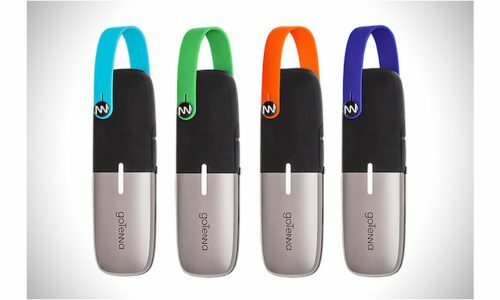 When compared to a standard tent, they are quite expensive. For instance, the model that I stayed in carries an MSRP of $1,425, which is substantially more than you’d pay for a standard camping tent. That said, the roof top models do come with a number of advantages, not the least of which are fast set-up times, extra comfort, and plenty of room. Whether or not those conveniences offset the higher price tag is completely up to you, but those are not inconsequential things to consider. On the other hand, a roof top tent is also MUCH less expensive than an RV for instance, which is an entirely different style of camping altogether. And, if you factor in the cost of staying in a hotel room, the price of one of these tents doesn’t seem so bad after all. Depending on your needs, it is possible that a roof top model could actually be a cost effective investment. After spending two nights in a Tepui tent, I can say that it is a wonderful way to go camping. I really appreciated the fact that I was sleeping on a comfortable mattress and was positioned well above the cold ground, which added a lot to the overall experience. 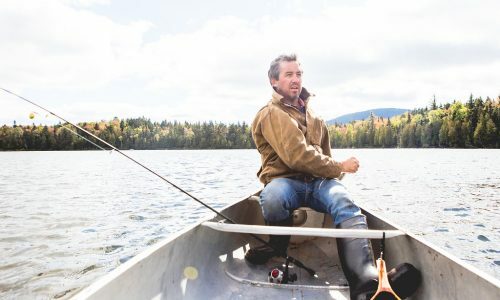 Each morning I woke up feeling very refreshed, and when I crawled into my sleeping bag at night, there was a sense of quiet relaxation that I don’t always get when staying in a traditional tent. By the end of my second night, I was already wondering if Tepui made a model that would work on my vehicle. When it came time to leave our campsite, it took just a few minutes to collapse each of the various tents and get ready to hit the road. The White Lightning was once again the speed champ, closing up shop in mere seconds, although it didn’t take long for the others to come down either. Had we been moving on to another campsite, we could have even left our sleeping bags in place inside the roof top shelter and they would have been ready and waiting for us when we arrived at the next destination. That’s a handy feature that you can’t pull off in a standard tent either. If you’ve been considering giving a roof top tent a try, I’d certainly encourage you to explore that option further. Like me, you’ll probably find that it is an extremely comfortable and convenient way to camp. Just be warned; once you try it, it is extremely tough to go back to sleeping on the ground.